Fried rice of any kind is always a family treat. To start, it’s a great one pot recipe that will be sure to delight. Secondly, it’s the type of dish that you can make with leftovers that actually tastes better. We all have THAT person in the family who proudly proclaims that they don’t eat leftovers… until of course you whip up fried rice. They have no idea that the secret to actually making this dish is to use products that have been cooked before and thus have greater flavor. Regardless, even if you make this dish with fresh rice it’s still a huge fan favorite. 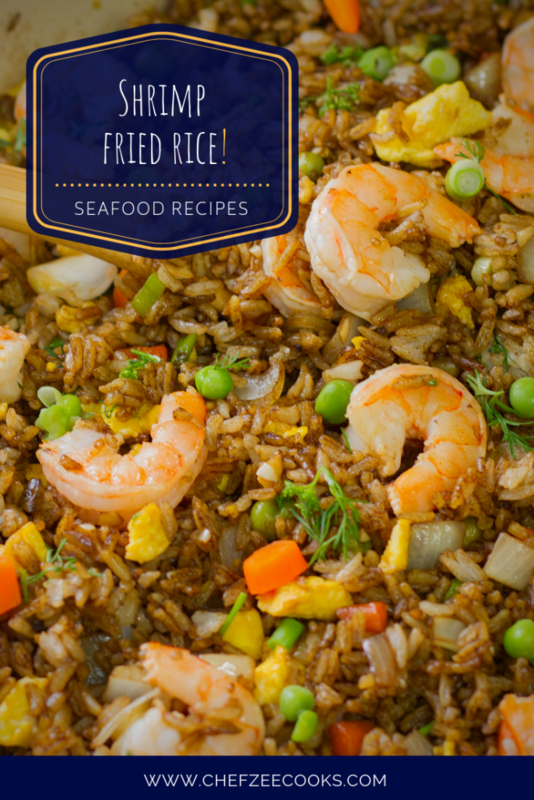 Today, I’m sharing a Lent favorite– Shrimp Fried Rice. 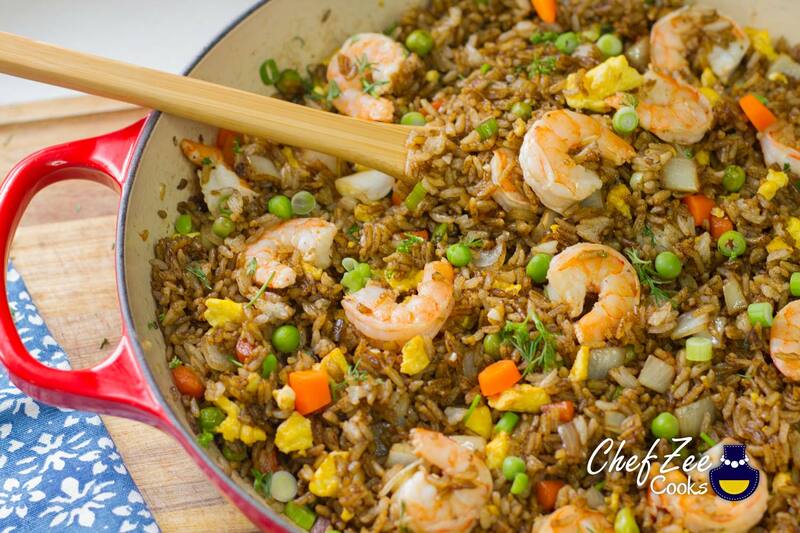 Shrimp Fried Rice is a super easy yet flavorful dish that you can make in 15 minutes if you’re using leftover white rice. Otherwise, this dish will take about 30-40 mins, Nonetheless, that’s still pretty good when you have a hungry family to feed! Last year, I shared a Dominican version of Fried Rice called: Chofan. This rice included chicken breasts, ham, rice, and tons of veggies. Today’s recipe is no different except we’re swapping out the meat for seafood! Suddenly, you’ll be thinking twice before ordering takeout. While Shrimp Fried Rice is super easy to make, many make the mistake of overcooking the shrimp and the scrambled eggs. Remember, shrimp is fairly delicate and doesn’t take long at all to cook. In fact, nothing is worse than rubbery overcooked shrimp. The same can also be said for overcooked scrambled eggs. The key is to lightly saute the raw shrimp until they just turn colors and remove them from the skillet. Add the shrimp back into the pot at the very end and cover the fried rice with a lid. The steam will do the rest of the cooking for you. In the end, you’ll be left with perfectly cooked and juicy shrimp. But what about the eggs? To start, the eggs are totally optional. Despite there being eggs in your usual Chinese take out, people still scoff when they see eggs in homemade fried rice. Why? I don’t know. But no worries if you’re not a fan of eggs in your fried rice. This is an easy fix– just omit them. Now if you add eggs, I highly suggest scrambling the eggs in a separate skillet and adding them at the end just before you add the shrimp. All in all, it’s best to make the eggs just before you serve this dish. The eggs keep their fluffy yummy texture. Lastly, like any typical rice dish, Shrimp Fried Rice can feed a village. You can also eyeball this dish from beginning to end and season to your liking– with all of the ingredients. If you’re feeding a large family, feel free to make more than the 4 cups of cooked rice that this recipe calls for. Add more shrimp if you truly want to as well. When it comes to the saute veggies, I personally love onions and scallions so I’m never shy about adding extra. The same goes for the soy sauce. Don’t be afraid to substitute regular soy sauce for low sodium soy sauce. Add as much as you like– or as little. Tailor this dish to your liking and don’t be afraid to give it a spicy twist! In a large pot, make 2 cups of long grain white rice which will roughly yield about 4 cups of cooked rice. In a separate pot, bring water to a boil and add carrots and peas. Boil for about 5-10 until carrots are tender. Dice carrots and set aside. In a small mixing bowl, season large raw shrimp with salt, peppers, and ½ sour orange. Set aside. If you don’t have sour oranges, feel free to use fresh limes or lemons. Now add diced white onion, garlic, and half of the scallions. Saute until they become translucent. Feel free to add a pinch of salt help the veggies sweat. Now add white rice, diced carrots and peas, Mix together until well combined making sure to work out clumps that may have formed in the white rice. Next, add sesame oil, rice, vinegar, and soy sauce. Mix until well combined. Once eggs have been mixed into the fried rice, add finely chopped cilantro and scallions for added freshness and crunch. Then add shrimp being sure to carefully fold into the rice. Cover pot with lid and reduce flame to the lowest possible setting. Simmer on low setting for 5 minutes. Serve warm.